Ring section (BB4) pump aerial view of in process installation. With an engineering first approach, Chicago’s Hydro, Inc., proves the impact of redesigned and engineered pumps by testing their real-time hydraulic and mechanical performance at its state-of-the-art Test Lab. 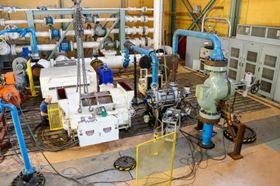 It is in the 46,000-square-foot- facility that Hydro develops and implements engineering modifications for improving the performance of critical pumps and then verifies that performance in the lab. Thanks to high-quality capabilities in testing vertical, horizontal, and submersible pumps, Hydro made history in September 2015 by becoming the first recipient of full certification of the new Hydraulic Institute Pump Test Lab Approval program. This new industry standard is designed to assist pump OEMs and other pump test laboratories to improve their current laboratory procedures and policies by working with a third-party auditor to develop and maintain accurate, uniform and repeatable pump testing protocols. The program also helps participating organizations adhere to the requirements of the international test laboratory accreditation standard (ISO 17025) concerning test measurement equipment. Since it opened in 2010, Hydro’s 5,000-Horsepower Test Lab has helped to troubleshoot problems with pumps in the field by isolating the pump from its system in a controlled environment to simulate field conditions in a safe manner. Single-stage horizontal split case (BB1) pump test with customer motor – test loop. The program has been designed around the new “Hydraulic Institute Program Guide for Pump Test Laboratory Approval” (HI 40.7–2015), which summarizes the key elements of this voluntary program. Any qualified domestic or global corporation, research institution or laboratory can participate in the HI Pump Test Laboratory Approval Program. Facilities must have in-house capabilities to conduct pump performance tests to “Hydraulic Institute Standards for Methods for Rotodynamic Pump Efficiency Testing” (HI 40.6–2014) standard, personnel that understand HI standards and pump testing techniques, and quality systems that ensure continued best practices after the audit. As part of the program, qualified laboratories agree to periodic audits of their facilities, records, equipment and personnel to determine compliance with the HI 40.7 program guide and HI 40.6 standard. In addition, the program promotes an increased level of assurances to pump end-users, as well as energy advocates and electric power utilities, which are working with HI to develop an Energy Rating label that accelerates the adoption of premium efficient pump systems. “The driving force is the changing pump efficiency regulatory environment and the opportunities to decrease the energy consumed by motor driven systems, such as pumps, through regulation and voluntary labeling initiatives,” said HI Executive Director Michael Michaud. HI 40.6-2014 Methods for Rotodynamic Pump Efficiency Testing was developed by HI to meet regulatory testing needs, and the Department of Energy (DOE) has incorporated HI 40.6-2014 by reference in the pending Energy Conservation Standard, EERE-2011-BT-STD-0031, and Test Procedure, EERE-2013-BT-TP-0055, for Commercial & Industrial Pumps (CIP). Hydro is capable of testing horizontal, vertical submersible, and some reciprocating pumps. It can test pumps up to 5,000 horsepower and can achieve a maximum flow of 42,000 gpm. All testing is completed in accordance with HI 14.6-2011 and API 610 (or other relevant standards such as ASME and ISO). The testing facility includes an above-ground tank that is 48-feet-long with a 12-foot diameter and has the capacity to hold approximately 38,000 gallons of water. The tank can be pressurized up to 100 psi to match a field suction condition. The tank pressure can be depressurized with a vacuum pump. The Test Lab strategically serves pump users throughout North America and operates for a variety of industries including oil and gas, power generation, fossil, steel and more. It is dedicated to the needs and requirements of the pump aftermarket. Because Hydro is independent, it is able to offer unbiased recommendations in every test situation. Vertical pump pre-test check list in process – with customer discharge head and motor. Hydro underwent an independent audit, completed under the guidelines published by HI. The audit reviewed test procedures, processes, instrumentation, software, and other capabilities. Any qualified domestic or global corporation, research institution or laboratory can participate in the HI PTLA Program. While the whole process can take several months from start to finish, the audit itself generally takes either one or two days, depending on how prepared the laboratories are and the number and types of pumps being tested. “Being prepared means having in-depth knowledge of the standard, but also well-trained staff and great internal processes and documentation,” Michaud said. The guidelines are clearly outlined in the Program Guide for Pump Test Laboratory Approval (HI 40.7) which is available for download at no charge on HI’s Website. The pump industry has made vast improvements through the years in material and engineering upgrades. However, hydraulic performance enhancements have not kept pace with mechanical upgrades and modifications. As the pump industry prepares to face the new challenge of increased efficiency, reliability and savings proactively, Michaud said the PTLA program will have a significant impact on the industry moving forward. In the past 10 months, Flowserve and Crane Pumps & Systems have also earned the prestigious certification. Currently, there are a few other facilities in the process of applying for and scheduling audits. Hydro overcame many challenges from the beginning while designing a test laboratory that can configure and test all makes, models and configurations of centrifugal pumps.